The economic news improved somewhat from my last update. The labor market looks more solid than it did a month ago and there are some signs the manufacturing sector may have found it footing. I believe the Brexit vote will likely have only a modest direct impact on the US, but will make all observers less confident of their predictions for global growth. This summer, the fed may try to convince the market that it will hike again in September, but my guess is that the December will be the earliest. Our latest reading for the Astor Economic Index® (“AEI”) is higher than last month, and at near the highest level posted this year. I still see the US as currently growing above average. The AEI is a proprietary index that evaluates selected employment and output trends in an effort to gauge the current pace of US economic growth. The labor market has been doing its noisy best to upset the stomachs of economists. June’s payroll number showed a solid recovery from the weak numbers posted for April and May. That being said, smoothing the series somewhat by looking at year over year percentage change shows that the US economy is still adding jobs but at a somewhat slower pace than has prevailed over the last few years. The nowcasts produced by the Federal Reserve banks of Atlanta and New York are both still showing stronger growth in the second quarter than the first. The Atlanta Fed is currently estimating 2.3 SAAR and the New York Fed 2.1. These are both slightly weaker than last month’s estimate. Both have been updated since the employment report. The biggest economic surprise of the year has been the vote for the UK to leave the European Union. At Astor, we were pleased to provide rapid reaction to this event on our blog on the morning and afternoon of the vote. I think our analysis holds up well: see CEO Rob Stein’s take here and mine here. As some of the dust has settled, short term implications for the UK economy are seen as dramatic by many economists. For example, the panel of economists surveyed by Consensus Economics is now forecasting 1.1% growth in 2017, down from a 2.1% forecast last month. Reductions for growth in the Eurozone are smaller. Consensus Economics now forecasts 1.4% in 2017 down from 1.6%. These same economists are not currently seeing significant direct effects on the US or the rest of the world. The swift resolution of the UK leadership contest (with a new Prime Minister this week as opposed to the September time table originally announced) may offer grounds for optimism that a deal may cut short the period of uncertainty. I see Brexit uncertainly leading to reduced investment by both firms and households as the primary channel affecting UK GDP. 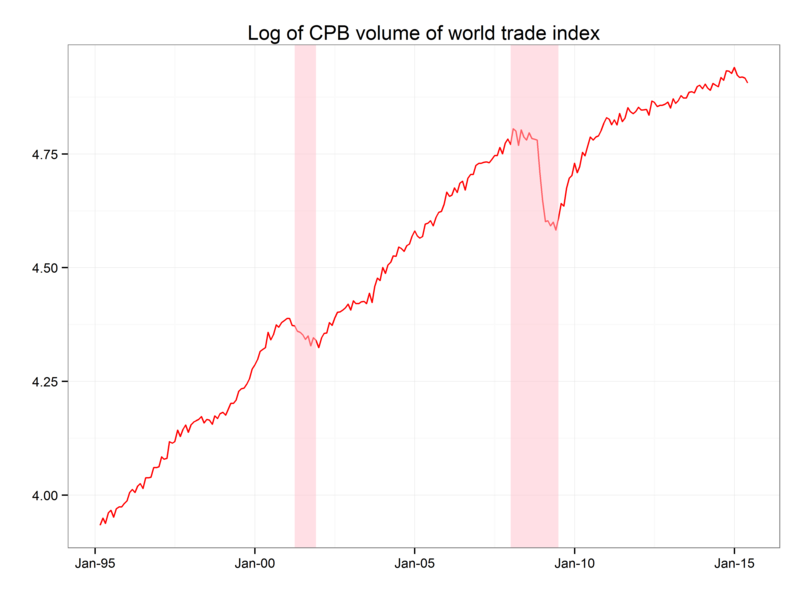 To the to the extent that the uncertainly will have sustained spillovers into the financial markets it could have indirect effects on the US. For example, the dollar initially rallied after the vote, but is now about the level that obtained in early June. Should the dollar appreciate against our trading partners, it would be expected to make exporting more difficult. In my opinion, the largest effect, however, seems to be in government bond yields. US ten year yields have moved down 25 basis points to a yield of around 1.50% as this note is being written. While, some of this may be safe haven demand that one can hope will be reversed as a path forward emerges, there are few of the other typical signs of investor fear. Investors willing to take 1.5% for 10 years may be foreseeing long spell of a worrying lack of attractive opportunities for investment in the US and abroad. When last we heard from the fed, their rate-raising plans were put on hold by the poor payroll numbers in April and May. Does the decent report for June portend another hiking scare? I think it is too soon to tell. My interpretation of their speeches is that for the fed to raise rates they need to be convinced that the labor market is at full employment and that inflation will return to target in the medium term. The last report has some points for both sides. If the decision was finely balanced before, then in my opinion the Brexit vote strengthened the doves’ position. Neither inflation nor the labor market are likely to see a boost because of it, and I imagine the decline in yields has the fed’s attention. My guess is that a few hawks will try to make the case for a hike over the summer but that the fed will not hike before December. For what it’s worth, the most common interpretation of rates implied by fed fund futures market sees only a small chance of a hike before the end of the year, as opposed to the situation in January when more than one additional hike was priced in. A sustained return to the relatively robust labor market we saw over 2014-2015 would increase the likelihood of a hike. Overall, I am relieved the labor market seems to have bounced back from a weak April and May, but I will feel better about the economy if we see this strength confirmed over the next few months. In my opinion, the latest numbers on the US economy were positive last month. After plummeting for the first half of February, stock markets became markedly more positive over the second half. International equity prices seem to have regained their footing and oil prices are well off the lows of the year as well. 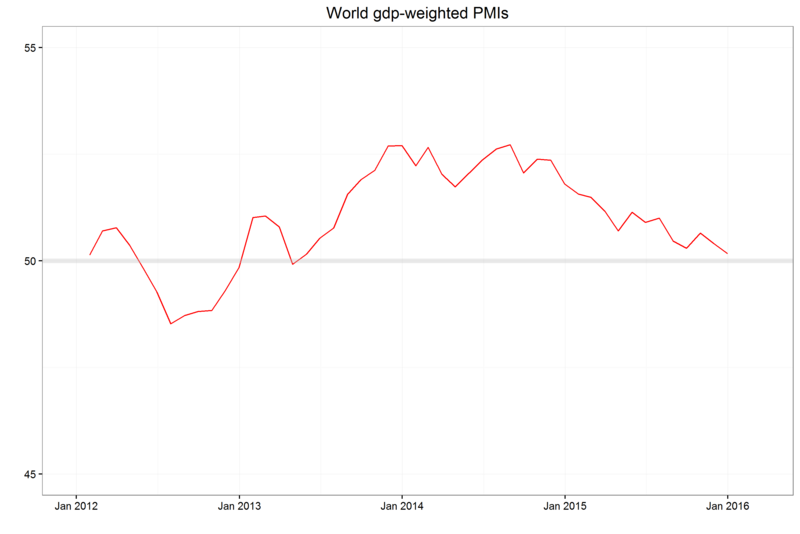 I still see the global growth environment as tepid: with the US being the main bright spot. Despite the international headwinds, I expect the Fed to begin to signal it will continue to tighten according to plan. 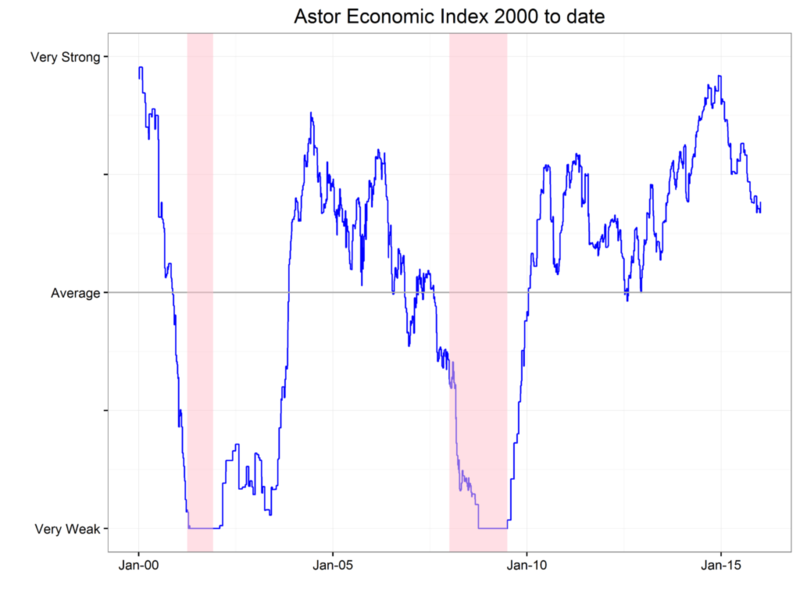 Our Astor Economic Index® (“AEI”) shows growth somewhat above the recent average and slightly stronger than last month. The AEI is a proprietary index that evaluates selected employment and output trends in an effort to gauge the current pace of US economic growth. I saw the employment report (nonfarm payrolls) for February as broadly positive. The number of new jobs was almost exactly at its two year average. 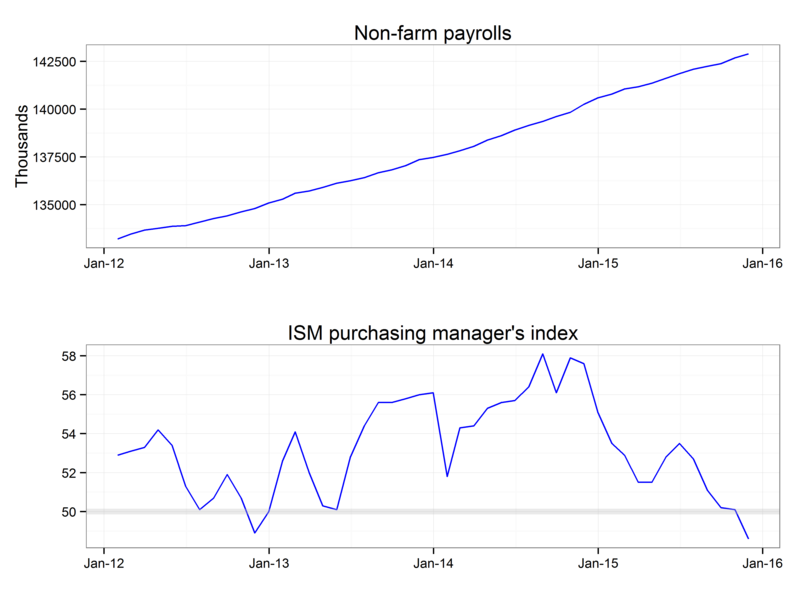 I see no sign of broad based weakness in the economy when viewing the payroll numbers. Readers who want to burnish the negative case may have to dive into the weekly aggregate payroll. This number takes the number of employees and multiplies by the hours per week and again by dollars per hour. The result is something like a weekly wage bill and it posted a rare down month in February as hourly earnings and hours worked both posted modest declines. In short: I think the pessimism in the first two months of the year were driven by fearful projections rather than data and that current views of the state of US economy are more realistic. 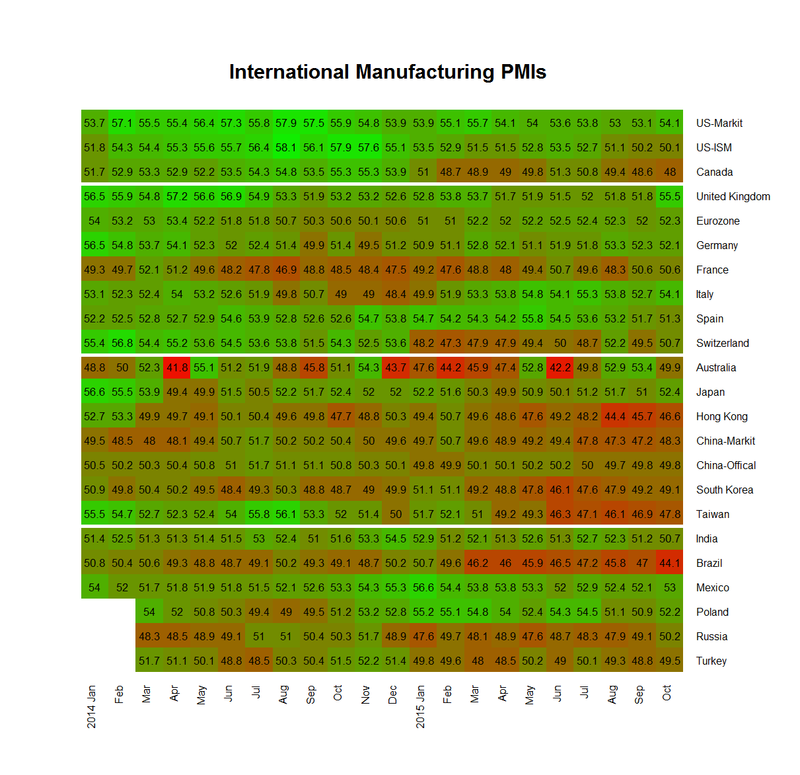 Last month, I was hoping for signs of strength in the world manufacturing cycle. It seems as if my hopes will have to wait at least until spring. While the Institute for Supply Management’s Manufacturing Index for the US showed a modest (but welcome!) bounce for the month, the picture in the rest of the world was not so rosy. 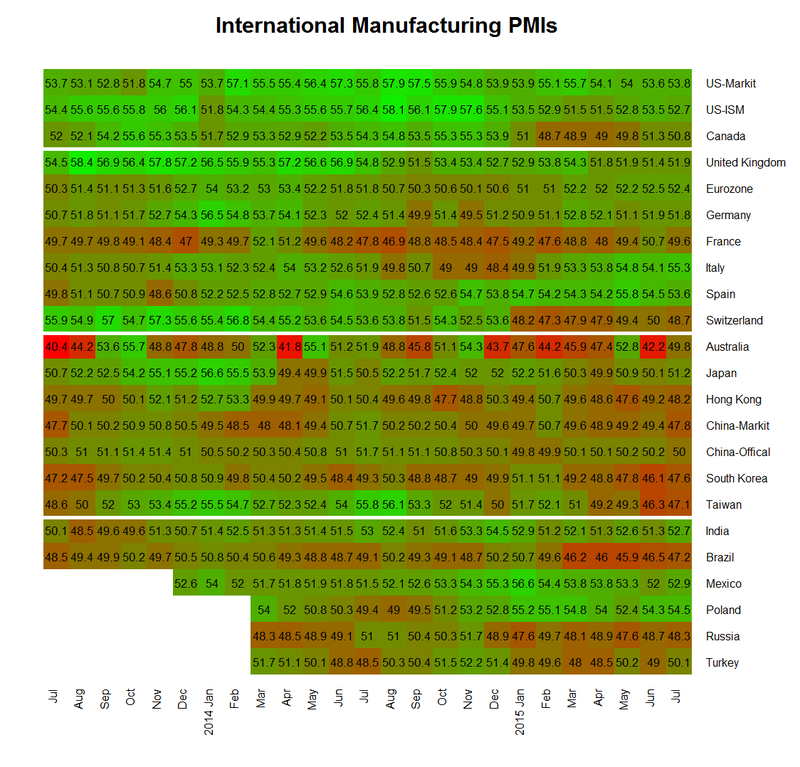 The chart below weighs PMIs in roughly the G-20 countries, each one weighed by their GDP. This measure is looking for new low since 2012. I believe the next red-letter day for the market should be FOMC Chair Yellen’s post meeting press conference on March 16th. Few expect the Fed to raise rates but many will be placing bets on the nature of the committee’s communications. Will the FOMC be hawkish or dovish? The Fed has repeatedly said they are data dependent and not tied to the calendar. However, as University of Oregon Economist Tim Duy has pointed out: we will need some clarity on which data they are dependent on. In my view, the case for promising to raise rates again soon is that continued strength in the economy will move unemployment below the natural rate by a fair amount and perhaps for an extended period. In the view of Vice Chair Stanley Fischer for example, such labor market strength would risk setting off enough of an inflationary process that even larger rate hikes would be necessary to contain it. However, I believe there are several complicating factors to give the Hawks a pause. First, is the tightening of financial conditions reflected in higher rates for corporate borrowers as well as the volatility and general decline of equity prices. 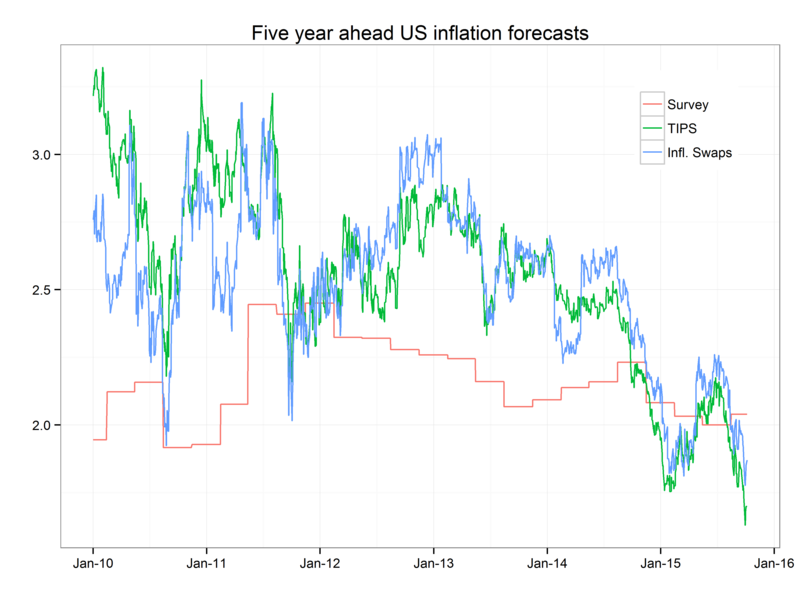 Second, inflation expectations, while hard to measure, may be declining. Inflation expectations derived from market prices are substantially lower than they were a year ago though survey-based expectations may have stabilized. The chart below shows five year forward forecasts of CPI from surveys an derived from market prices. My prediction is the Fed will raise not rates in either March or April and instead, focus on the tightening in the financial markets and weakness in inflation expectations in its released statement. Therefore I am expecting the Fed to promise two or more hikes in 2016. My preference (if I were a voter) would be for the Fed to make it clear that it is willing to be symmetrical around the 2% inflation target and would tolerate a year or two above the target as we have spent each of the last 8 years below it. Overall, I am pleased to see continued growth in the US despite the tepid international environment. I expect the Fed to try to move back towards, but not fully achieve, its plan of four hikes this year. The US continues to post moderate growth, though pockets of weaknesses remain. Global financial markets started the year trying to read the magic eight ball of the Chinese equity and currency markets – a recipe for emotional distress. Overall, my judgement about the current expansion remains unchanged with slightly above-average growth. · Our Astor Economic Index® (“AEI”) shows growth somewhat above the ten-year average and slightly better than last month. The AEI is a proprietary index that evaluates selected employment and output trends in an effort to gauge the current pace of US economic growth. · The most important and timely indicators for December 2015 were mixed. On the positive side, payrolls were quite strong and above expectations. The only quibble with last Friday’s report being recent signs of wage growth seem to have stalled. I believe a sustained period of real wage gains will be necessary for a robust consumer sector and hence a strong economy. · On the bad news side, the weakness in the manufacturing sector as measured by the ISM Purchasing Managers Index continued. Industrial production, as measured by the year-over-year change in the Fed’s industrial production index, turned negative for first time since the recession in last month’s release. I tentatively started calling a manufacturing recession last month and I feel a bit stronger about that now. The non-manufacturing PMI is still fairly strong and though it is off its recent highs, it is still about the average level in the current recovery. · While I still see the current (that is, for early 2016) state of growth as above average, it is looking like the fourth quarter will see a weak GDP print. The Atlanta Fed’s GDP Now project is currently forecasting growth below 1% (quarterly SAAR). · The Fed finally began to raise rates with its December meeting. 2016’s market volatility, on its own, is unlikely to cause the Fed to reconsider its path unless it gets more extreme. It is said central banks tighten according to plan and ease in reaction to events. The consensus seems to be that the Fed’s plan is to tighten a quarter point at every other meeting or so for a while, as long as the economy continues to hold its present course. Weak inflation prints, however, could give the FOMC pause. With energy prices moving lower again this year it is hard to see early inflation prints being strong. See Tim Duy’s dissection of the December minutes for more. · If the Fed does stay the course, the next big obsession for Fed watchers will be when they will begin to allow their QE investments to roll off. The Fed currently reinvests coupon and principal payments on its portfolio in similar securities so as to maintain a level portfolio. The first step to reducing the balance sheet will be to cease this reinvestment. (For a dated but still, I think, correct description see my Cleaning Up After The Party Is Over). Expect fevered commentary about the issue this summer if nothing else spices up the dreary lives of central bank observers. · My reading of the global picture has not changed. The fundamental fact of the global economy today is the weakness in China and the attendant disruption in the supply chains built up to feed its growth. I believe we see this result in the broader commodity weakness as well as the manufacturing weakness discussed above. o Paul Krugman on when China stumbles. 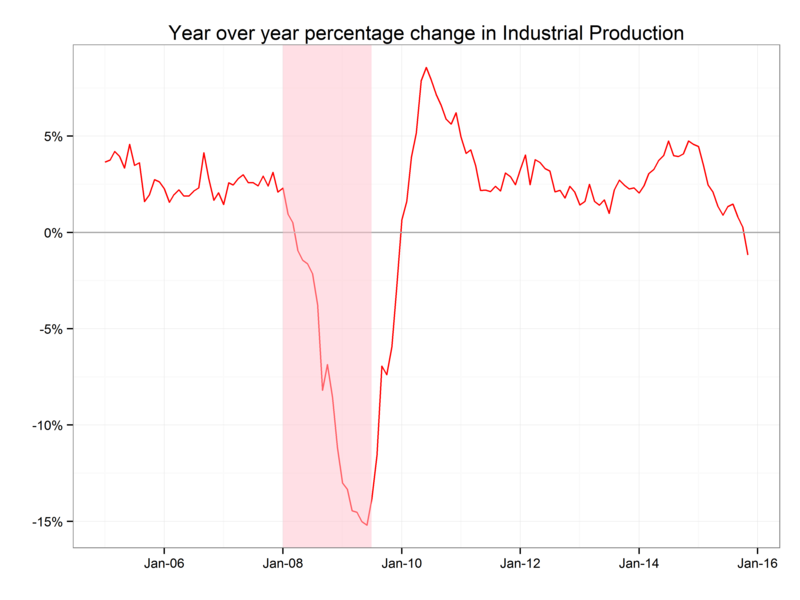 · Note too that the US is not alone, the UK’s industrial production also recently turned negative year-over-year. 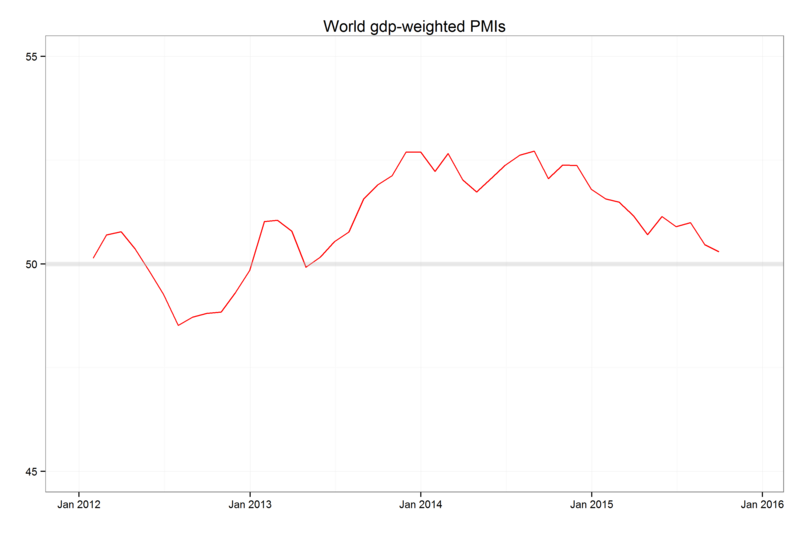 Globally, the GDP-weighted manufacturing sector PMI has been declining steadily for the last 18 months, though it is still above the lows seen in this measure in 2012. Note too that those low levels were associated with a stagnation, not a decline, in the level of global industrial production. · In addition to the diffuse reduction in commodity demand, there is an energy specific supply shock. One can imagine this an oily game of chicken among suppliers waiting to see who will take remove supply from the market first. Overall, I see the US as currently in modest growth and perhaps we should be pleased the Economy has done as well as it has in a challenging external environment. The US economy continues its pace of modest expansion. Though self-sustaining growth continues to be the most likely outcome, a few soft spots – mainly related to weak growth overseas – continue to worry. I expect the economy to adapt well to the beginning of a shallow and gradual rate hike cycle. 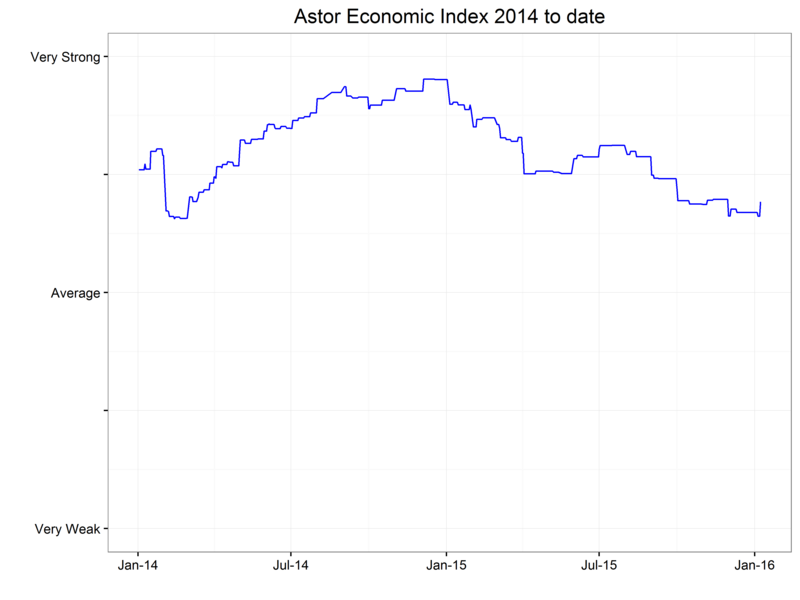 Our Astor Economic Index® shows growth somewhat above the ten year average, though it is lower than a month ago. The AEI is a proprietary index which evaluates selected employment and output trends to try and gauge the current pace of US economic growth. Good news first. The broad economy continues to expand as can be seen in the steady pace of jobs growth. It may be a promising sign for the future that construction jobs continue to grow at a slightly faster rate than they have since the Great Recession. The housing sector has been weak in the recovery and improvement would be welcome. The weakness in the manufacturing sector continues as demonstrated by a range of indicators. The latest survey from the ISM was below the line demarcating manufacturing expansion/contraction, though this level is consistent with a growing economy, not a broad recession. This is also reflected in the index of industrial production. The manufacturing sub-index has been weak all year, though not nearly as weak as the mining sub-index. 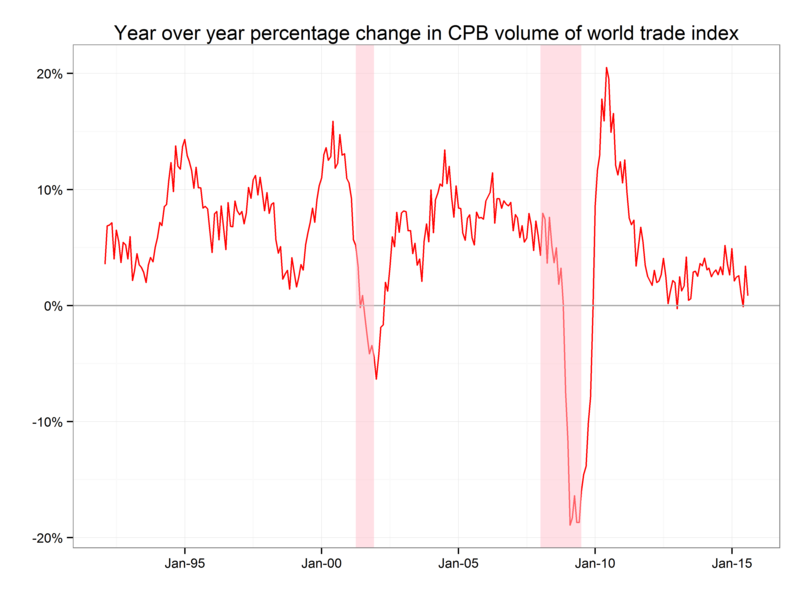 I see this weakness mainly as a consequence of the slower pace of growth in the Chinese economy leading to broad emerging economy weakness which, in turn, is directly reducing prices on commodities produced in the US as well as reducing overseas demand for US produced intermediate goods. As part of the financial markets reaction to this adjustment the dollar has rallied about 20% against a broad currency index over the last 18 months. The IMF estimates that the dollar movement alone has reduced US GDP growth (by reducing net exports) by about 1% in the last few years. Will this manufacturing recession spread to the rest of the economy? I do not believe recessions can be forecasted at significant horizons, so I will not lay odds. My guess, however, is that it would take significant further deterioration in the global environment for this to happen. And whatever odds you place on them, it is also possible that the headwinds the US is facing in the external environment will begin to dissipate or at least stop deteriorating next year, a slightly optimistic vision. The continued decent growth in the US in the face of some overseas challenges is one of the reasons why the Federal Reserve will begin raising rates shortly. They seem to be anticipating the attenuation or reversal of growth constraining factors and hope that by starting rate hikes sooner they will not need to raise them as much. Additionally, if we take the Fed at their word, they are worried about labor market slack being close to completely used up. If I were on the FOMC I would vote against a hike as the Fed’s inflation target does not seem to be close to binding any time soon and because I would be hoping to decrease the numbers of involuntary part timers as well as try to move the labor participation rate back higher, though demography limits potential gains. Be that as it may, the Fed is still likely to initiate a rate hike, followed by a stately pace of follow-up rate hikes. Given that the Fed has not begun to shrink its balance sheet (maintaining a substantial stimulus) and that fed funds may only be around 1% a year from now, few serious observers are anticipating that this will seriously hurt the economy. Overall, I am still cautiously optimistic on the US economy, though less so than last month and I will be watching developments in the export sector closely.